War has long been the subject of the art and within this genre posters have been important vehicles for communication. Posters are used to arouse public opinion. They reflect changes in attitudes, political trends and social issues. They are advertisements and sources of information. In short, posters are a record of the time. 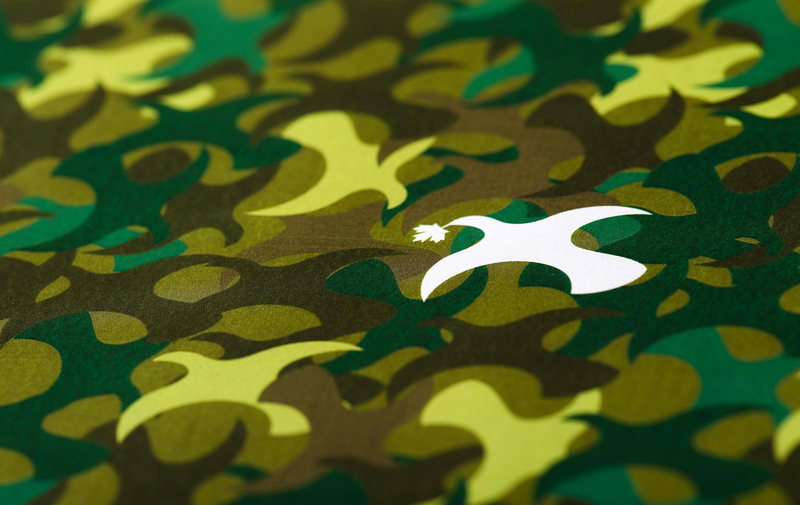 Designers have used their talents to rally both for and against war to create powerful graphic statements. 2005 marked the 60th anniversary of the bombing of Hiroshima and Nagasaki and a world which is still witness to armed conflict. 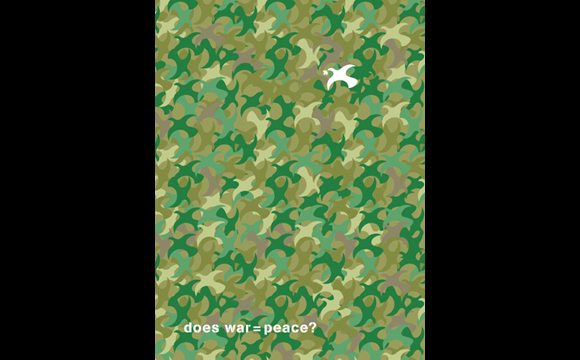 Lest We Forget: Canadian Designers on War featured the responses of prominent Canadian graphic designers to the subjects of war, anti-war and peace. The show challenged viewers to think differently and perhaps act differently. Emdoubleyu Design was one of 25 Canadian designers selected to contribute to this exhibition of war posters. Lest We Forget: Canadian Designers on War was organized by the Triangle Gallery in Edmonton and premiered at The Works Arts and Design Festival in Edmonton in June 2005 and then toured across Canada. I grew up hearing quite a lot about the effects of war. My father was a child in Birmingham during the Second World War, and he often spoke to us of seeing the sky lit up by incinerating buildings at night. The orange glow of the city lights reflecting in the sky near where we lived outside of Peterborough, Ontario always reminded him of the flames of Coventry burning. Evacuation for he and his grammar school classmates to the nearby village of Hinckley was commonplace as were sleepy stumbles in the middle of the night to the bomb shelter at the bottom of the garden when the air raid sirens started wailing. I have also seen war from the front line through my grandfather’s eyes in his diaries, first as a teenage private at Vimy Ridge where Canada is said to have attained its nationhood. He describes watching biplane dog fights and the amazing new aircraft that would change combat forever. Then again in the Second World War as a seasoned officer as they pursued the Nazis through paralyzed and ravaged Holland, helping them to repair and rebuild the country with the occupation forces in 1945. He and his family were also there to see that country rebuild itself physically and spiritually. For me personally war is many things. It is above all a violent, atrocious horror. But it has shaped and influenced our country and my family alike. For better or worse it has strengthened my love for Canada and my self-image as a Canadian. But since those early days of war, I have to ask “is there a place for war?”. Do we need it to achieve defined rights and freedoms among nations? I have also seen amazing negotiators in my lifetime: Lester B. Pearson and Steven Lewis for example. They have used an artillery of skills that don’t require a trigger. With all this insight I still don’t know what the balance between conflict and resolution is. What is the price for peace? I do know however that Canada has a major role to play in maintaining and extending peace because we place a very high value on our own sense of fairness and right to dignity.